Poznań’s medieval heart is fighting back against gaudy and brash shopfronts that defile other cities by rolling out a number of restrained and tasteful fronts designed to blend into the historic district. A hotel, a pet shop, a shop selling herbal blends, a butcher and a chip shop centre will all receive new signboards showcasing their name and function. Designed by students at the city’s University of Arts, they share a sparse, clean aesthetic that does not detract from their historical surroundings. The shops are located in the Cultural Park area in Poznań’s Old Town. Established by the city authorities last year, and covering the Old Market Square and streets leading to it, the Cultural Park’s purpose is to protect and highlight the character of the medieval surroundings, with building facades and even advertising adapted to it (officials modelled it on similar arrangements in Kraków and Wrocław). 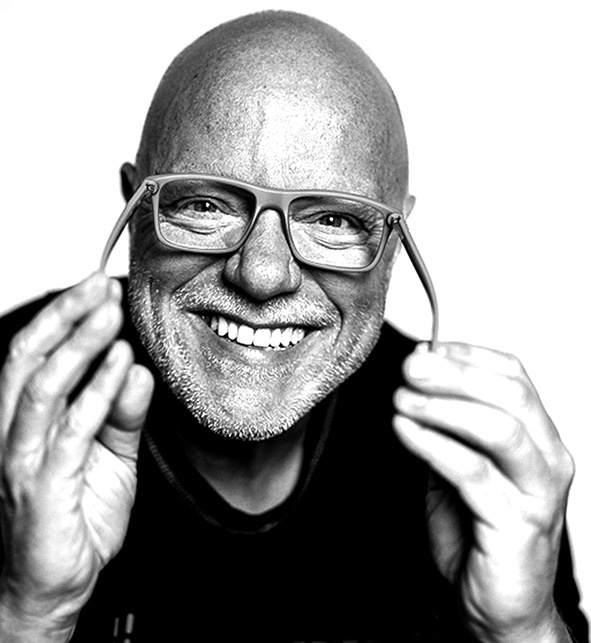 The signboards were selected in a competition for students at Poznań’s University of Arts. In contrast to the loud and haphazard advertising that dominates many city centres, entries were supposed to be minimalist and form part of a coherent whole. Anka Nahumko came first for her elegant logo for the Pensjonat Centrum hotel, which features golden lettering and a set of cross keys. She also designed matching accessories featuring the cross-keys logo, from business cards to a door sign. 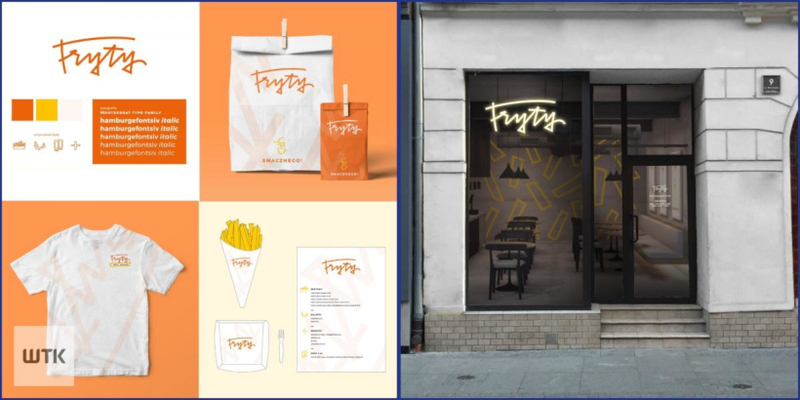 With its glowing “frytyki” sign, the chip shop front designed by Daniel Kubacki came joint second. The theme is continued on the back wall, decorated with chunky yellow chip outlines. 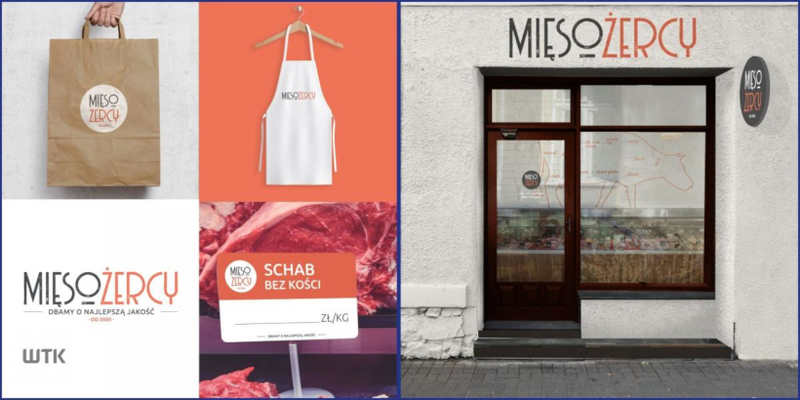 He shared second place with the butcher’s shopfront designed by Patrycja Kaja, which bears the name Mięsożercy – literally “meat eaters”. The outline of a cow, with different cuts of meat labelled, behind the meat counter is visible through the glass shopfront. The herb shop storefront by Klaudia Zabłocka, with its large windows, simple lettering and minimalist plant logo, came third. The Kot i Pies (Cat and Dog) design for a pet shop by Ewelina Pieńkowska, featuring clean printed letters on a rich fir-green façade, won the Internet Community award. Pieńkowska also designed accessories featuring the shop’s name and a paw print, including simple cloth bags, brown paper packaging and a loyalty card. The entries were judged by Dr Wojciech Janicki, head of the Sign and Identification Laboratory at the University of Arts, along with representatives of the city’s conservation office and Yos.